Chromsystems has launched a new LC-MS/MS kit for the analysis of methylmalonic acid (MMA) in plasma, serum and urine. Methylmalonic acid is an intermediate of amino acid metabolism and is regarded as an early and sensitive biomarker of vitamin B12. A deficiency leads to increased levels of MMA in plasma, serum and urine. The use of special Clean-up Tubes enables a quick sample preparation that removes interfering compounds effectively. 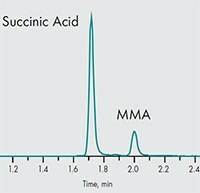 False-positive test results are prevented by chromatographic separation of the isobaric compound succinic acid. Precision of results is ensured with stable isotope-labeled internal standards as well as the matrix-adapted 3PLUS1 Multilevel Plasma and Urine Calibrators.